 EqualityMaine was first known as the Maine Lesbian/Gay Political Alliance (MLGPA). The group was founded in response to the July 1984 murder of Charlie Howard, a young Bangor man who was attacked and murdered simply because he was gay. There was another catalyst that summer: Dale McCormick, a longtime champion of equal rights, was among those chosen to represent Maine at the 1984 Democratic National Convention in San Francisco. Upon her return, McCormick and other openly gay Mainers realized it was time to come together and build political power for the state’s LGBT community through advocacy, education and lobbying. MLGPA began with an ambitious desire for full equality, but as a practical matter, it had a humble start. A band of volunteers went to work with $147 that they’d raised by setting up a table at a local autumn festival. In the mid-1980s Maine – like many other states – was just starting to engage in new conversations about fairness and equality. Should the state improve access to public facilities for disabled and handicapped citizens? Should women in the state government receive pay equal to their male colleagues? 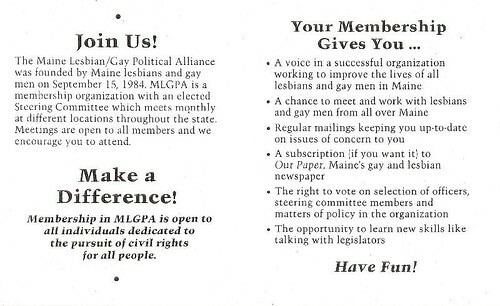 One of MLGPA’s earliest projects was a survey, completed in 1985, that measured the impact of violence and discrimination in LGBT Mainers’ lives. Sixty-seven percent of respondents said they had concealed their sexual orientation in order to avoid discrimination on the job; almost 30 percent had been fired or denied promotions because their bosses learned they were gay. Almost one-quarter of respondents had been denied service in a hotel or restaurant, and 54 percent had been victims of violence motivated by their sexual orientation. Clearly, the need for non-discrimination protections was real and urgent. For two decades MLGPA worked to build support for legislation that would protect LGBT Mainers from discrimination, and to include attacks on LGBT citizens under the state’s definition of hate crimes. 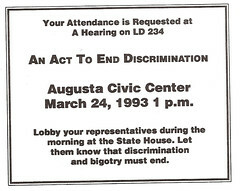 The latter goal was achieved with an amendment to the Maine Civil Rights Act in 1993, nearly 10 years after Charlie Howard’s death. The enactment of Maine’s non-discrimination law in 2005 was the culmination of efforts by MLGPA, its coalition partners, fair-minded legislators and thousands of volunteers who contributed time, energy and resources to the campaign. Years of hard work paid off when, in an overwhelming majority, Maine voters struck down a referendum that sought to overturn the 2005 non-dicrimination bill. Maine became the last New England state to protect its LGBT citizens from discrimination in employment, credit, housing, public accommodations and education. While non-discrimination legislation and hate crimes protections were early and important goals, EqualityMaine – the name MLGPA adopted in 2004 – has worked on a number of other fronts, including family medical leave and state health policies. In recent years we have helped pass major health legislation, including the HIV/AIDS Medicaid Waiver, which expands health care access to HIV-positive individuals who live below the federal poverty line. On the national level, we have called for a fully-inclusive federal Employment Non-Discrimination law (ENDA) to improve upon the current ENDA that excludes transgender citizens. We have also called for repealing the Don’t Ask, Don’t Tell policy that perpetuates discrimination against LGBT Americans who serve their country with honor. Our conversations with Maine’s Congressional delegation are ongoing, and we will continue to make equality a priority in Washington, as well as in Augusta. On November 8, 2005, after nearly three decades of working to pass non-discrimination protections for LGBT Mainers, Maine became the 16th state to protect LGBT people from discrimination based on sexual orientation or gender identity and expression in employment, housing, education, credit and public accommodations. Maine is the sixth state whose law includes gender identity and expression. These protections were enacted by amending the Maine Human Rights Act. Similar bills had been vetoed in 1993 and repealed by referendum in 1998 and 2000. EqualityMaine worked with Maine Won’t Discriminate to win a resounding victory against the 2005 people’s veto, as Maine voters upheld the non-discrimination law by a margin of more than 10 percent. Our EqualityKnocks voter ID and grassroots organizing program, launched in 2004, helped reach thousands of voters during the successful 2005 campaign. EqualityMaine’s legislative work has made headlines, but in many ways, the story of these victories has taken place behind the scenes. We’ve grown from a handful of volunteers to a full-time staff of four, plus an active board of directors and several part-time consultants. Our membership spans the state, including everyone from high school students to great-grandparents. Our volunteers have numbered in the hundreds – and whether they’re stuffing envelopes, working at the polls, phonebanking or gathering signatures, they’re advancing the cause of equality, one day at a time. We’ve come a long way since we began. And we’ll keep going until LGBT citizens have full equality in the hearts and minds of Maine people, and in all areas of the law.